On Friday 20th December 2013, we walked from Latimer Road to Trellick Tower, seeking out climbs. The city opens itself to the urban climber and our dérive was one that incorporated the vertical and transgressive, giving ourselves a heightened appreciation of the details of mundane walls and unremarkable urban furniture that typically go unnoticed, untouched and unexplored. Such engagement with the built environment involves employing a vision that is developed as a result of an embodied practice that cannot help but overflow into everyday experience. Regardless of any intention to climb, the eye seeks out routes and paths; geometries and textures suddenly acquire meaning and potential. A playful reimagination is achieved; imagined futures are enacted and recorded and the praxis produces a fresh set of features. For a brief moment, ledges become crimps, a protruding brick becomes a sidepull, a drainpipe becomes a layback. Photography offers a means of granting a provisional stability to these transitory forms, a visual permanence to the angles and surfaces. A quirky, niche, everday practice unfolds onto the city, and an everyday medium gives it an existence beyond its own temporality, emanating digitally through a network of likeminded individuals clutching similar devices. As this method of seeing the city reaches into an individual’s every encounter with the urban, it seems appropriate to employ an apparatus that lends itself to the everyday: the mobile phone. The camera is not felt. Unlike some of our explorations, our journey that day was not one of performance with any conscious consideration of representation. Instead it was one of play and discovery, of ‘drifting purposefully’ (Sinclair, 2003, p.4). En route we inevitably stumbled across landscapes and the flotsam and jetsam of the city: old mattresses with accusatory notes and spaces set aside for no discernible reason. 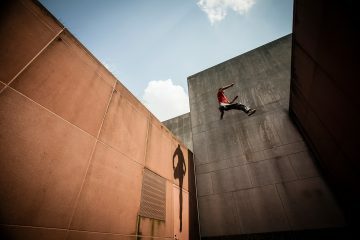 Emerging as a product of and subject to contemporary digital technologies, parkour and buildering are inherently social activities and a sense of connectivity contributes to a practitioner’s understanding of identity and positionality. 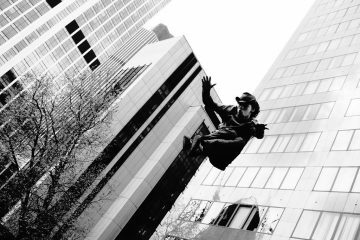 Essentially, to go out and encounter the city through such praxes is, in many regards, as much about the image creation as it is about the physical engagement of running, jumping and climbing. 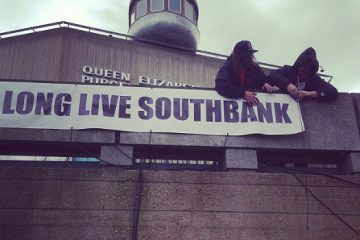 Parkour and buildering, as expressive, ludic, experimental and sometimes narcissistic urban social formations (Daskalaki & Mould 2013) create and recreate themselves through a constantly evolving network of imagery and interconnectivity, through virtual expressions and digital media. The instantaneity of mobile phone photography might be assumed to give its resultant imagery limited value, but the images’ transience and temporality are fundamental to their expression and these aspects contribute to a non-visual aesthetic. The temporality of the medium seems to correspond with the temporality of the praxis. 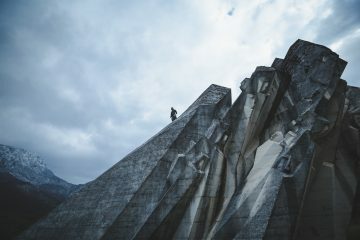 Our parkour that day was an intermittent and transient engagement with the terrain, bringing vertical paths momentarily into existence before erasing their presence with our departure. When received, the images are comparatively brief visual experiences; they appear in Facebook timelines and Twitter feeds for only a short period before disappearing amongst the noise of other exchanges. But it is the brevity that also grants these images their reach: what an image might sacrifice in longevity is redeemed through its accessibility. 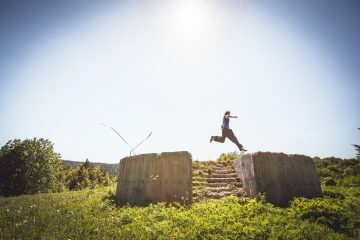 Parkour is a fundamentally embodied experience that encounters surfaces and fear, where physical preparation and maintenance combine with mental and emotional conditioning. It is a heightened appreciation of spaces that might otherwise go unnoticed or unseen, taking value in details and establishing an understanding of a passage of time that is not felt by anyone else. Bricks crumble. Cement gives up. Railings become loose. Paint flakes away. If we return, we might find that favourite routes have disappeared whilst others may have since emerged. The apparent permanence of the built is seen instead as flux, as subtle, inevitable shifts, as entropy and regeneration which in turn present new opportunities for physical engagement. The insertion of the body brings new meaning to the city, as a site for experimentation and serious play. Bobby Gordon-Smith, Nadja Hahn, Farid Herrera. Daskalaki, M. & Mould, O., 2013. Beyond Urban Subcultures: Urban Subversions as Rhizomatic Social Formations. International Journal of Urban and Regional Research, 37(1), pp.1–18. Available at: http://doi.wiley.com/10.1111/j.1468-2427.2012.01198.x [Accessed January 12, 2014]. Sinclair, I., 2003. Lights Out for the Territory, London: Penguin. Wow, this was a great read. Very beautifully written. I know exactly how you feel. When I’m out and about I can’t help but imagine routes from the environment I see around me. You also brought up a few great points, but one of them that I never really considered was the fact that most of our favourite spots are temporary and might not be there the next time we visit them. Thank you for this thought provoking article Andy.